CRUSHCURATORIAL is pleased to present I’m Your Man, the first solo presentation of artwork by Rebecca Warlick. The exhibition premieres seven multi-media paintings and sculptures made over the course of the last year. Invested in painting as a method of covering, Warlick’s experimental urethane compositions suggest the artist’s pivot away from traditional means of painting in pursuit of plastic-poured painting. Concealing bygone layers of wood panel with a material that cures in minutes, Warlick integrates epoxy clay forms into a selection of these works. Fabricated through mold making, the artist translates everyday objects into menacing marks to be preserved, repeated, and regenerated. Within her expanses of flamboyant color, marbling pigment, and uncanny non-portraits, Warlick reveals anonymous people and places that seem to melt from the vivid interiors of her carved substrates. A grimacing duck, seized by disembodied hands, is doubled by a ghostly pair of ducks hovering overhead like gargoyles emerging from the Chroma key blue backdrop. 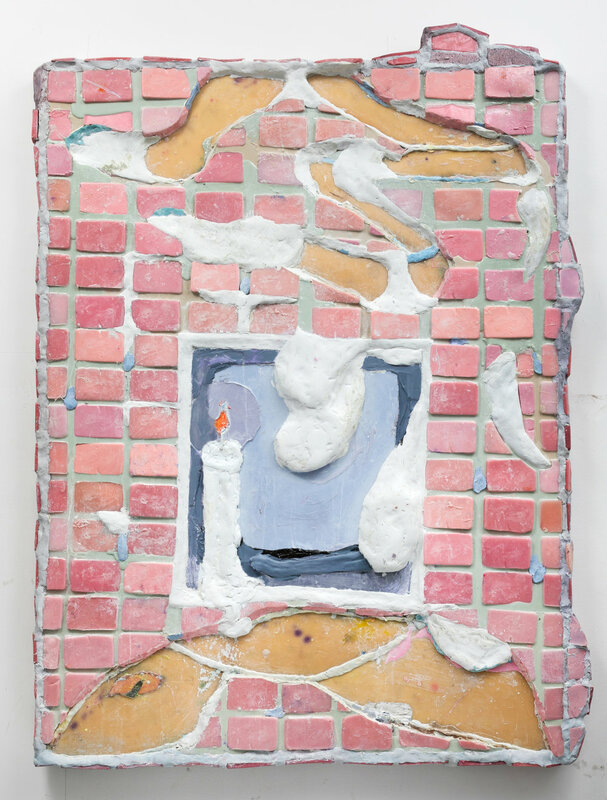 A pink tiled window pane, with a single candle burning at center, is interrupted by a scattered assemblage of limbs, like a body attempting to break through the saccharine cheer of domestic space. Here, Warlick reformulates the familiar, integrating animalistic spirit and architectural edifice into a world made strange. Her investigations engage a sense of touch and a desire to release or disentangle what we know or mistake as our own experience from the oozing, enigmatic underworld of her compositions.